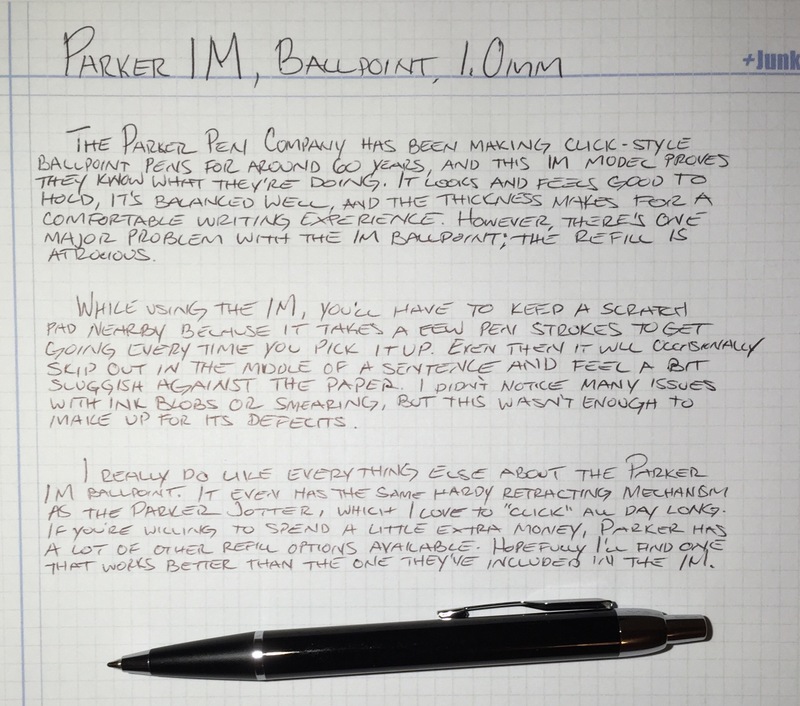 The Parker Pen Company has been making click-style ballpoint pens for more than 60 years, and this 1M model proves they know what they’re doing. It looks and feels good to hold, it’s balanced well, and the thickness makes for a comfortable writing experience. However, there’s one major problem with the 1M ballpoint; the refill is atrocious. While using the Parker 1M, I have to keep a scratch pad nearby because it takes a few pen strokes to get going. Even then it occasionally skips out in the middle of a sentence, and it always feels a bit sluggish against the paper. I didn’t notice many issues with ink blobs and smearing, but this wasn’t enough to make up for its deficits. I really do like everything else about the Parker 1M ballpoint. It even has the same hardy retracting mechanism as the Parker Jotter, which I love to “click” incessantly whenever I use it. If you’re willing to spend a little extra money, Parker has a lot of other refill options available. Hopefully I’ll find one that works better than the one included here.